It were an exhausting few last weeks. After I returned from Boston, I had a couple of days to catch my breath after which I left for Malaysia. There was the CGAT 2010 conference I was planning to attend in Singapore but I decided to take some holidays before as well as after the conference. Malaysia is a great country! Lots of different things to see and do. A rich cultural heritage, magnificent rainforests and remote islands with nice beaches. An excellent mix. After little over a week having spent there, I went to Singapore to go to the conference. The conference on itself was okay. I just returned from Boston where I attended the SEARIS (Software Engineering Architectures for Realtime Interactive Systems) Workshop and the IEEE VR (Virtual Reality) Conference. The workshop was fine! Rather small though with around 45 people joining. My presentation went very well, with a nice discussion afterwards. The conference on itself was in fact a disappointment. I expected to go to a very large conference and a major exhibition, something like SIGGRAPH which I attended two years ago. 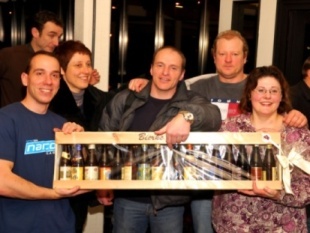 A friend of mine has created this huge online database on Belgian Beers (BelgischeBieren.eu). Admit it! We do have the best beers in the world! ;-) The strong point of the website is a very advanced search functionality. However, this is not the only functionality. People can also register on it, give comments and keep scores on particular beers. Through collaborative filtering, the system is then able to recommend certain beers to you. So, if you are interested, register yourself! This academic year, the VUB Diving Center exists for 20 years. This is being celebrated with a number of activities. One of those activities was a swimming pool competition between different diving organisations in and around Brussels on the 26th of February. A new and improved website is now online. This time, I am going to try to update it more regularly. I know, I have probably said this multiple times already. ;-) A few days ago, I was looking into other systems to create my website in, yet again. If it was easier to manage and quicker to update the website, I would definitely do this more often. However, in the end, I decided to stick with Drupal. Now that a colleague and myself are busy working on the website of our research group, for which we also decided to use Drupal, we were bound to spend more time in getting to know the system.